The new Preacher promo released by AMC introduces Jesse's wicked Gran'ma, portrayed by Betty Buckley. AMC's hit graphic novel adaptation returns in just a few weeks and the network has been releasing new trailers and sneak peeks to prepare fans for third season. All of the promotional material released thus far seems to do more than hint that Ruth Negga's Tulip O'Hare is coming back from the dead. In fact, a recently released Preacher trailer details how she comes back, so it's not much of a spoiler. The new Preacher Season 3 promo puts the focus on Jesse Custer's homecoming. He is forced to return to Angelville to save Tulip, where Jesse declares that he'll do anything to help her. When Jesse arrives back to the Louisiana Plantation where he was raised he seeks the help of Marie L'Angelle, aka Gran'ma. The homecoming isn't exactly a happy one when old grudges turn deadly. According to a synopsis, "Jesse will need to escape his past... because the future of the world depends on it." There's a lot of mystery surrounding the Gran'ma character and how she fits in to being able to save Tulip, or what exactly why she wants blood from Jesse. She isn't very happy to see him return and doesn't really want to help, but there's always a way, especially when Jesse declares that he'll do "anything." 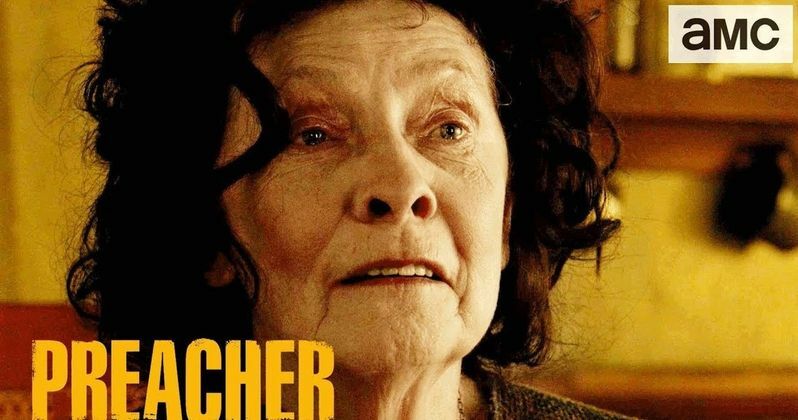 Gran'ma comes back by saying, "Anything... that's a big word..." The clip ends before we see anything further, leaving us hanging until June 24th when Preacher Season 3 premieres on AMC. Gran'ma doesn't look like a fun-loving family member and there's going to be more of her story told in the third season of Preacher. Additionally, it looks like Season 3 is going to shake things up a bit further, even more so than the events from last season, which saw Jesse split from his best friends. The new season is introducing a whole bunch of new characters to the world of Preacher and the stakes look like they've never been higher for the hard drinking, chain smoking Jesse Custer. Plus, with a visit home in the first episode, we're bound to get some more insight into the early life of the titular character. As previously noted, Preacher returns to AMC on Sunday June 24th. With Season 2 handling the quest for God, it will be interesting to see how Season 3 will progress, especially with all of the new characters that are being introduced. Beyond that, it looks like Preacher fans are going to be in for another rip roaring season full of crude humor and over-the-top violence. While the new clip doesn't do much in the action department, more promotional material for the hit AMC show will become available in the coming weeks. For now, you can check out the new Season 3 teaser for Preacher below, thanks to the AMC YouTube channel.